The MBase11 is the logical follower of the MBase01 and offers even better performance, more versatility and an even phatter sound! It generates analog bass drums, from extremely powerful to soft and covers the whole range from 909-style to 808-fashioned. And much more...the LFO has 8 different waveforms including true sine that can be used to create very different envelopes. The resulting sounds are not simply *kicks*... this turns out to be a bass drum *synthesizer*. Like the XBASE 999/888, the MBase11 has a compression parameter to vary the thickness of decaying sound. And it offers a variable gate time to to create very different sounding attacks and also has a metalize parameter to have hundreds of variations on the attack noise. The MBase11 purposefully sounds a bit different to the XBASE 999/888, making it a great sounding expansion for our other drum products and other analog percussion. The kick sets in very precisely and the attack sounds very snappy at all kinds of sound variations. It can also be used as a real bass with some limitations. If decay is cranked up it is long enough for tones and the pitch can be played on the keyboard in semitones over three octaves. Bass Drum — Although the MBase11 uses almost the same principle or block schematic for analog sound production as the XBASE999/888, the technology is different and results in a slightly different sound. Midi — The midi controllers of the MBase11 are identical to the XB09/X999/X888/AB/JB. All parameters including LFO can be remotely controlled by midi. The MBase11 is also compatible with our midi editors and templates in the bass drum department. 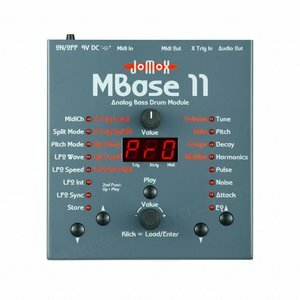 LFO — The MBase11 has an LFO that works on the pitch of the bass drum. The LFO speed can be edited in BPM or be syncronized by midi clock. As on the XB09/X999/X888/AB/JB, the LFO can be synced by a note trigger or might run free. Another feature is: we have implemented a one-shot LFO function that serves as an additional envelope. Weight: About 0.5 kg, 1.1lbs.